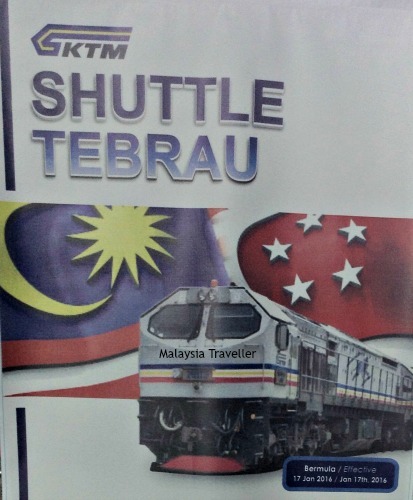 Shuttle Tebrau is the name given to the shuttle train service between JB Sentral in Johor and Woodlands, Singapore. Since all KTMB Intercity trains now terminate at JB Sentral station, the Shuttle is the only way to travel between Malaysia and Singapore by train. The journey across the Causeway takes just 5 minutes. 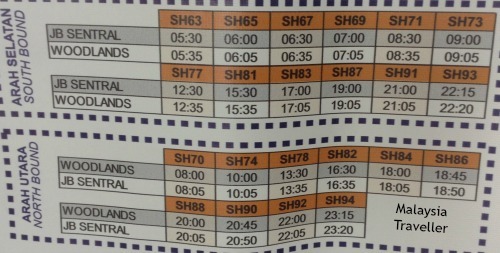 This is the latest timetable (as at March 2016). You can check KTMB’s official website for updates. Although the frequency of trains was increased from 17 January 2016, there are still big gaps in the middle of the day when there are no trains. Presumably the rationale is that the Shuttle is used mainly by Malaysians commuting to Singapore for work (and some in the opposite direction) so the services are concentrated around peak hours. This means that the trains are very busy and peak hour services get booked up days, or even weeks, in advance. If the train operator wishes to attract tourists to the service they will need to add additional trains, including at off-peak times. The other curious thing about the timetable is that there are 12 trains going to Singapore every day but only 10 coming back. The other 2 trains must return to Malaysia empty which seems a bit pointless. They’re coming back anyway, why not carry passengers? The one-way fare from JB Sentral to Woodlands is MYR5. The one-way fare from Woodlands to JB Sentral is SGD5 (i.e. nearly three times as much at current exchange rates). If you are coming from Malaysia you can buy a return ticket for MYR10. If you are starting in Singapore a return ticket would cost you SGD10. It would be cheaper in this case to buy two singles (for MYR5 and SGD5). Each train can hold 320 passengers, mostly seated but a minority will be standing only. Since it is such a short journey, standing up is not such a hardship. You can purchase tickets at any KTMB Intercity counter, or book online through KTMB’s website up to 30 days before the date of departure. Still cannot avoid the hassle of clearing Immigration (CIQ) checks at both ends. A delay at Immigration might cause you to miss your train.